Last week I spent an extra day in Grand Rapids, MI during their record setting November snowfall. 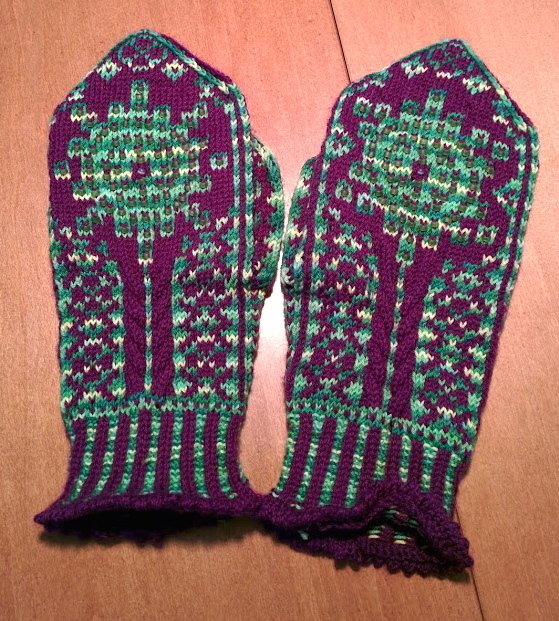 Thankfully by the second day, I’d finished my first Mystery Knit-A-Long project, some Marie Curie Mittens. Polonium and Radium as portrayed in yarn and beads. The picot edge does lay flatter after blocking. This was my first Mystery KAL, which I tend to be a little worried that the mystery will turn out to be something I don’t particularly like.. but with cables, beads and science… they certainly had things going for them. The inside of the thumbs have my initials and are dated. These were done in Cascade Heritage Sock, and Tipsy Sheep Socktails. Tipsy Sheep has cocktail inspired colorways, and is a local dyer that runs a monthly yarn club. I am 3/4ths the way through this 4 month club cycle and have already signed up for the next round. 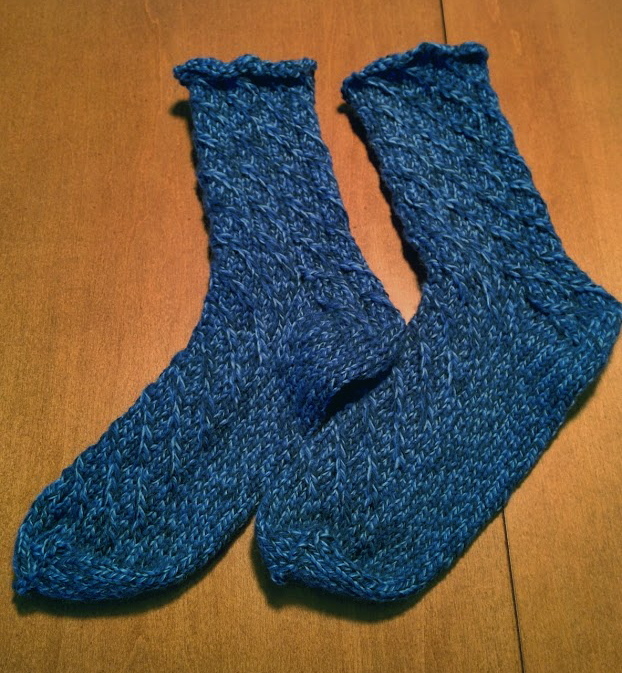 Which means that while my first pair of socks took nearly forever… I’ve somehow managed to get 3 pair done this year. 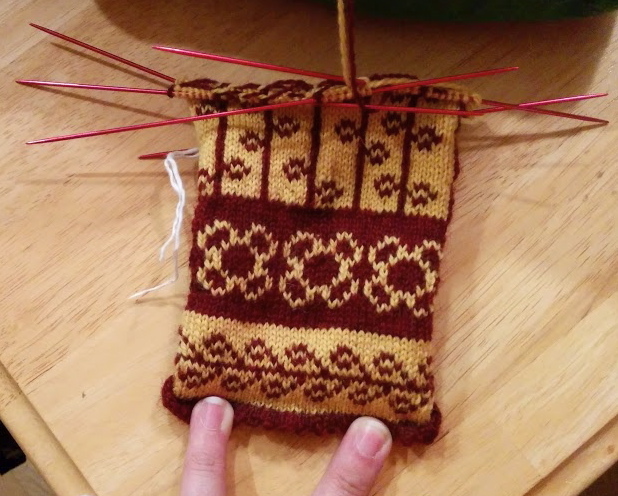 Apparently the key to overcoming second sock syndrome is interesting yarn and pattern. And magic loop method where its all one big circular needle does help. The simple cable here is actually done without using a cable needle, and because its worsted weight these knit up so much faster. 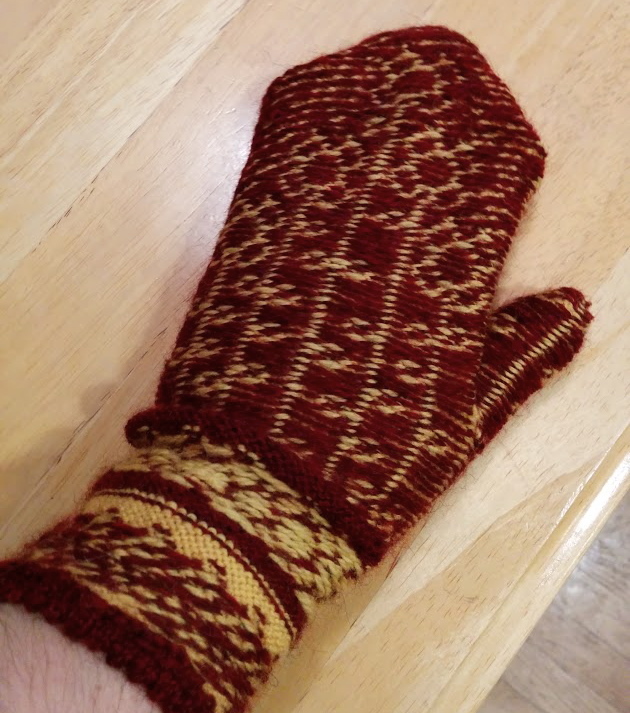 I didn’t just make one pair of mittens…. I made two! Sunshine yellow and brick red flowers, to combat the winter greys and whites. This is how it looks when you are working with your double points…. 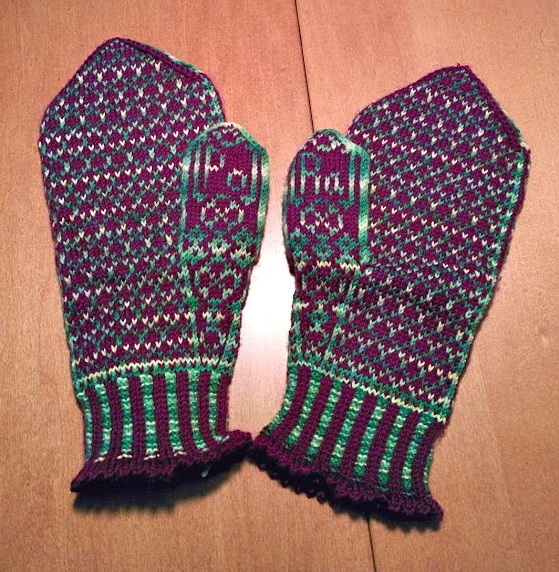 Working these two pair of mittens has inspired me to possibly attempt to make some geeky mitts next year. (Think similar to stockings, but with mittens instead) but I think I will want to pick up a magic loop size circular in these smaller sizes before I start making my own. Needle wrestling isn’t really my thing. And because I know its always a bit interesting to wonder how the inside of stranded color work looks like…. here’s an inside out mitten shot. (Technically these are a Christmas gift, but since I went to see the recipient early, you get the early Christmas update!) 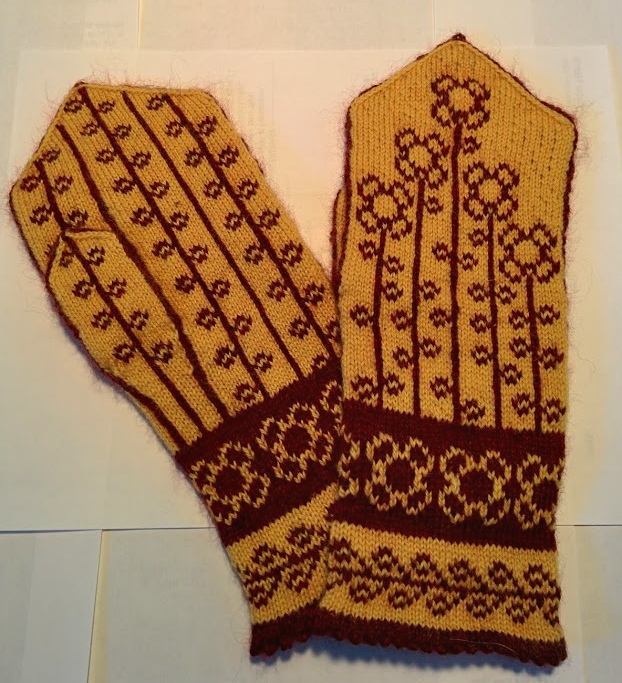 One amazing thing about this pattern was that unlike prior mitts, this pattern had one chart for the body of the mitten, with the thumb in the middle area. You got the left or right mitten based on which direction you read the chart! Mirrored coloration; loops instead of stitches making the pattern. Overtime these loops will felt together. Also, for my “guilty I haven’t updated in awhile” pile is one celtic cabled cowl, that was finished in time for Halloween decorations. I learned so many great cable stitches! One of my last outdoor photos before the heavy rainy season began. The first time through the cable pattern is slow and full of stumbles and learning, but once you get to the repeating it all starts to come together. Now if only I can get the rest of my planned projects for this year finished….